(CN) – Overpumping of groundwater during California’s six-year drought has caused land in the Central Valley to sink, threatening vital canals that provide water to nearly two-thirds of the state’s 39 million residents. 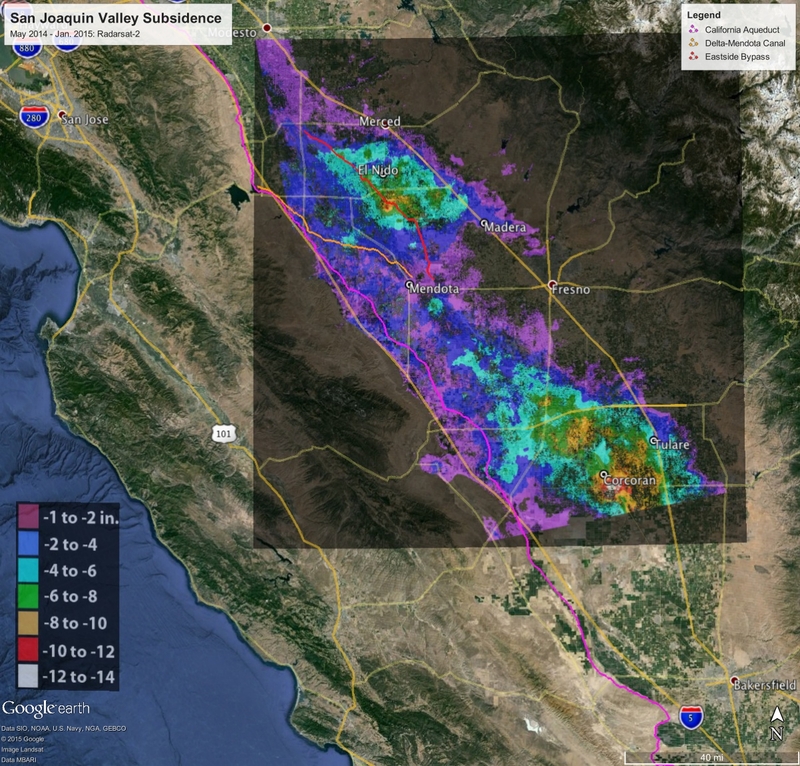 Sinking land could affect as much as 20 percent of water deliveries through the California Aqueduct to San Joaquin Valley farms and Southern California residents, state water managers said. Citing NASA satellite images that show the land dropping by as much as a foot each year, California officials said Thursday they will push for new laws to limit drilling. While state lawmakers approved legislation in 2014 that requires local governments to form sustainable groundwater agencies to regulate pump-and-recharge to improve groundwater supply management, the law gives local agencies until 2040 to fully implement groundwater plans. “Considering the damage we’ve seen now, we can’t wait until 2040,” said Jeanine Jones, a California Department of Water Resources manager. Sections of the 444-mile-long California Aqueduct have dropped more than two feet in some places, officials said. “Besides aqueducts, the increased subsidence rates have the potential to damage levees, bridges and roads,” the department said in a statement. The department estimates that a comprehensive rehabilitation of the California Aqueduct would cost hundreds of millions of dollars, while focused repairs to address conveyance losses in the most affected areas would costs tens of millions of dollars per location.